Good news! The latest issue of Hot English (186 – the November issue) is out now! Learn over 300 useful words and expressions and improve your listening skills with Learn Hot English! 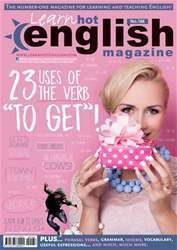 This month: 23 uses of the verb “to get”. Learn how this useful verb is used to mean lots of different things: to receive, to become, to arrive... Plus, 12 useful words and expressions for talking about the train, 10 useful words for talking about jobs, useful words for talking about your rooms in your house, 8 expressions on the topic of eath, “town” idioms, “time” phrasal verbs... plus: • Economics – world facts. • Marketing – airline stories. • Travel – popular cities. • Grammar – compound nouns. • Film – Bridget Jones. • Nature – dangerous animals. • Culture – world dances. • Movie review – Public Enemies. • Politics – Ted Kennedy. • TV – Fame. • History – Coco Chanel. • Art – house museums. • The law – unusual lawsuits. • Music – controversial stars. • Slang – our dictionary of slang. AND LOTS, LOTS MORE! By reading and listening to all this great content, you'll improve your English reading and listening skills and learn up to 300 useful words or expressions. Plus, you'll get a better job and pass English-language exams more easily. Guaranteed! Why you should visit Cornwall!